No detail is too small for Erwin Mortier. It is as though he has taken up the pen of Marcel Proust with which to tell us about World War I, and initially I became frustrated at the lack of movement. But, I pushed on and found a tender beauty in every description, and passages which I had to mark with pieces of paper torn off from the letter beside me. We begin with an elderly woman named Helena, who is lovingly cared for by a gentle woman named Rachida. We listen to this elderly woman, speaking in the first person, tell us how she is carefully set against pillows after she has been carefully washed and combed for the day. She is set up with a writing desk, notebook, and pen. It seems evident that she is recording her memories, the details of her life with her family and then her husband. Going back in time, and sometimes staying in the present, we learn what it was like to be a girl in France when the Archduke was murdered. And then when the presence of the war was felt. It is the women who take the blows, he was wont to say. Imagine the look on the face of a mother with two or three sons at the front, not exactly a rarity in large farming families in the countryside. The uncertainty behind the certainty that you are knocking at her door to report the death of one of her children . She has seen you coming across the yard. above the hedge of the front garden with the country flowers, which have been so immaculately hoed and raked, since weeding helps take her mind off the fate of her boys, she has recognized your hat. She has heard the gate creak. She would like her house to bean unassailable fortress, a thick shell. she sees you coming across the yard or up the garden path. She realizes that this time there is no blood on the lintel and side posts of her door, that the angel with the sword has not spared her house this time–all she does not yet know is which of her sons has fallen. The reference to the Old Testament in this passage is beautiful. There is no Passover for the woman whose son is lost at war. She cannot strike branches of hyssop, dipped in lamb’s blood, against her door frame in the belief that the Angel of Death will pass over her home. How does one bear the ravages of war when there is so much agony? While The Gods Were Sleeping is an important book, as almost all the books nominated for the IFFP are. One doesn’t “like” such a book; one is moved by it, and lives in it, and is grateful upon closing the last page that one’s life is peaceful. 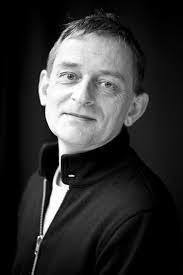 Erwin Mortier (1965) made his mark in 1999 with his debut novel Marcel, which was awarded several prizes in Belgium and the Netherlands, and received acclaim throughout Europe. In the following years he quickly built up a reputation as one of the leading authors of his generation. his novel While the Gods Were Sleeping received the AKO literature Prize, one of the most prestigious awards in the Netherlands, and has been translated into five languages. Paul Vincent taught Dutch at the University of London for over twenty years before becoming a full-time translator. In 2012 he was awarded the Vondel Translation Prize. Find more reviews at roughghosts, and David’s Book World. This sounds like a powerful novel, Meredith. I understand your hesitancy to read anything about war and agree that these are not the type of books we can like or enjoy, but rather, learn from and be moved by. I hope you are having a relaxing Sunday afternoon. I believe our windy weather will blow some warmer temps your way in the next day or two. We are basking in 60 degree temps! I don’t like reading about war, as you know, yet The Narrow Road to the Deep North, and this beautiful book, have been written so well that I can somehow manage it. They are books that show the horrors, but Rent without hope. I can appreciate how difficult this would be to read in your situation but I think Mortier captures beautifully the helplessness of those waiting at home, the mothers, siblings and wives, as in the passage you chose to quote. I loved the style of his writing but it can be too slow for some readers. It turns the lens inward. Yet I found that I became so engaged with Helena and those around her that by the time you reach the heart of the story, you feel like you are right there. In the end it all seemed to pull together like a beautiful, if sombre, piece of music. I wasn’t prepared for it to be so slow, which didn’t mesh with the fast pace I have forced upon myself to read as many of the long list as I can before April 9. But, you’re so right: it’s a wonderful style that did indeed turn the lens inward. As you can see, I chose such a small passage as the most pertinent one for me in my post. And yes, halfway through the book I was completely enmeshed with Helena’s story. Life. I like how you compare it to a beautiful piece of music. I hope this one makes the short list. Bellezza, this does sound very touching and beautiful, though understandably difficult to read. Lovely review. I have not read of WWI through a Dutch perspective (in the case of the author) nor a Belgium one (in the case of his heroine). That is one of the things I love so much about the IFFP; the books open my eyes to whole new perspectives. I can understand how difficult this novel would be for you, Bellezza (I know we’ve touched on this before in relation to All Quiet on the Western Front). While the Gods sounds very poignant, beautifully written and fully deserving of its place on the longlist. I’m glad you felt able to make it to the end. You know me well by now, Jacqui. I think one of the things that helps me read a book about war is when it is written exceptionally well. While The Gods Were Sleeping is a lovely book, really, for not only does it speak about war, but how it is to grow old and reflect back upon one’s life. As I age, as my parents age, it seems a thing that we are doing all the more. Hi Belezza – Thank you for stopping by my blog. I have been reading some of your posts. You have a very impressive blog. I like your writing as will as your choice of books. 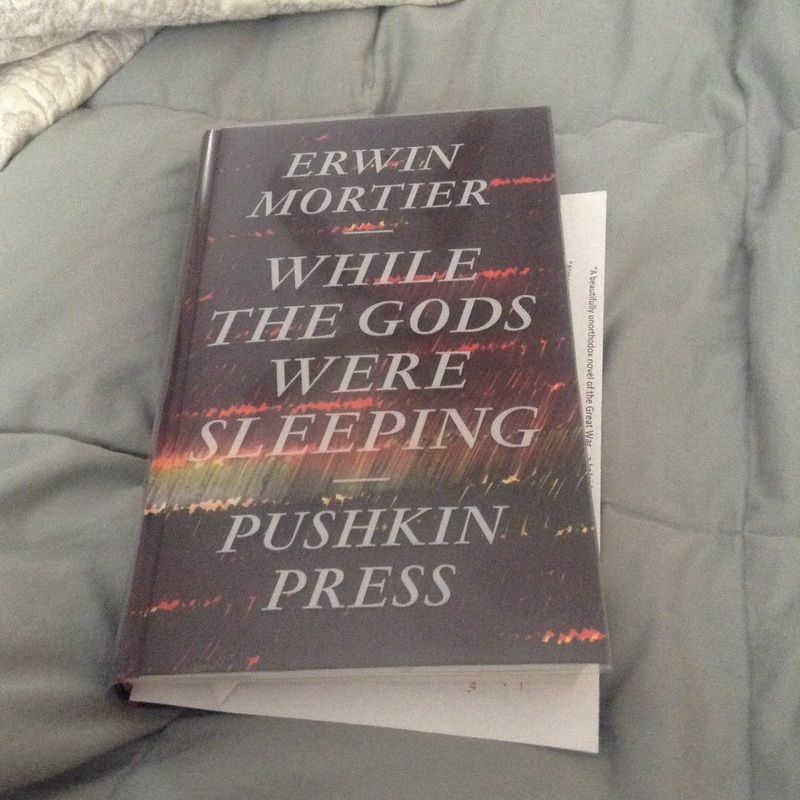 I have not read Mortier but I would like to. I am beginning to apprcaite books that move slowly as long as the other aspects of the writing are strong. I agree some very worthy books are books are not really books that one “likes”. Brian, so nice to converse with you officially! I, too, have enjoyed your posts and your blog. I am halfway through Proust’s Guermantes Way, so I am used to “slow” and lovely literature. I think I have just set an unfair pace for myself to read as many books from the IFFP long list as possible before the short list is revealed on April 9. It is not right to rush through books; I feel they must be read slowly to fully appreciate, but the time frame has caused me to feel an internal fast pace which I normally don’t put on myself. And I find that “like” is a term that can’t apply fairly to the IFFP list. One doesn’t always like what causes one to grow and stretch and think outside one’s box. It’s often uncomfortable, but it’s the very reason I love these books so much.